I keep highlighters in our classroom in carts, but it's always good for the kids to have their own, especially to use in their other classes. I wish I would have thought and specified a 4 color pack so it would be easier when we close read or color code, but I didn't think about it until just now! A must have! We use sticky notes daily in my classroom. We use them to chart our AR progress, we use them during close reading, we use them as book marks, exit slips. You name it, we use a sticky note for it! I know this is on every supply list, but when I moved from first grade to fifth grade 3 years, I wondered how the supplies would differ. 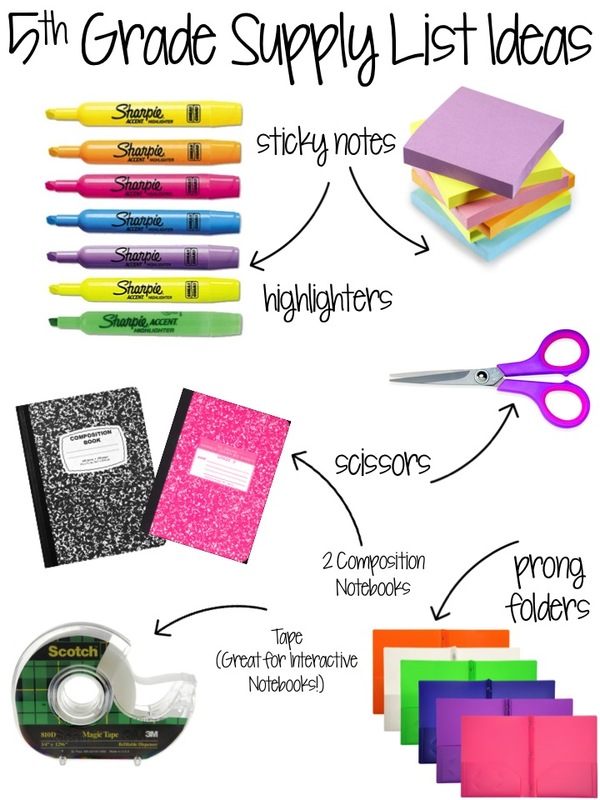 In first grade we used scissors and in 5th grade, we still do! I SO WISH I had thought about requesting tape. I HATE gluing on interactive notebooks because it takes FOREVER. My coworker uses tape and it seems so much easier! I may use donation money to purchase a class set. This isn't everything on my list, but just a few highlights. I really want to know what's on YOUR supply list! Comment below so we can all get some new ideas! Don't forget about the Readers' Choice Giveaway! Click here to enter.